Saying ‘Bonjour’, ‘Au revoir’, ‘S’il vous plaît’, ‘Merci’ and ‘Bonne journée’ to people in shops and yes, particularly the checkout girl at the supermarket, are considered fundamentals. Next time you go shopping during your holiday in France, try a breezy ‘Bonjour!’ and a smile as you enter a shop. It may feel unnatural and uncomfortable at first but watch the response that you get in return. 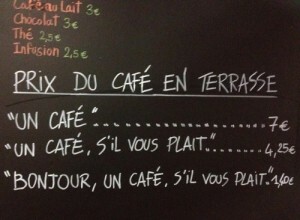 Remember also ‘s’il vous plaît’ when ordering that coffee and a bright ‘Bonne journée’ as you leave. It’s simple but makes a big difference. 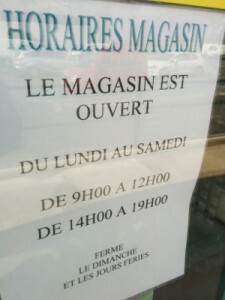 If you come from a country where 24h culture is the norm then it can be a bit of a shock to go on holiday to France. Although Sunday supermarket opening is slowly gaining pace, it is not yet widespread and very few supermarkets open all day on a Sunday. During the week, the big supermarkets now remain open throughout the day, but normal shops do close at lunchtime for up to 2 hours and sometimes more. Many also close on a Monday. As for late opening, you won’t find any of the traditional supermarkets open beyond 8pm and most other shops will have closed by 7pm. But be fore-warned and plan ahead and you won’t find yourself inconvenienced. Most people when they are on holiday in France rely on the good old supermarket for their food shopping. It’s convenient and easy, after all. 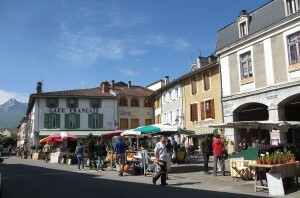 However, visiting the local town or village market provides an altogether more enriching experience. Not only is there a great atmosphere at most weekly French markets but you get the opportunity to meet local producers and buy the freshest and most delicious local produce too. Supporting the local economy on your holiday to France rather than handing your hard-earned money over to the supermarket giants also has to be a good thing. Buy jars of local honey, ewes milk cheese from local mountain herds, organic fruit and veg sold direct by the farmer and charcuterie produced from rare breed and organically raised pigs. Local producers will appreciate your support and you will be buying some of the best produce available. What an excellent introduction to French culture. Thankyou very much!